Simon & Schuster, 9781476743769, 384pp. 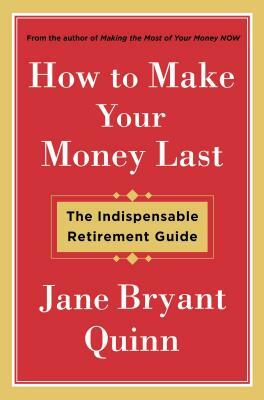 "Leading personal finance columnist Jane Bryant Quinn writes with clarity and compassion about the often stressful subject of retirement finances. She enlightens readers about the difficulties of determining how to get the most out of Social Security. (It’s not as simple as simply signing up for it.) Yet even those readers who understand every word she writes will be glad to come to the last chapter, “Just Tell Me What To Do.” There she lists the three numbers that matter when you’re making a retirement plan and offers an 18-item retirement checklist." "There is no more trustworthy figure in all of American journalism." "The book...remains at its heart the Joy of Cooking of personal finance. It provides the basics in just about any area you can think of—from what you should consider about money when you are in your 20s, to what to do with your investments once you have retired—and presents simple, straightforward recipes outlining the fundamentals of how to accomplish your goals." "I found myself racing through this gigantic compendium because it was engagingly written and full of useful information. And she writes compellingly enough to make you want to spend more time getting things in order." "Everything you ever wanted to know was somewhere in those pages...Quinn, the renowned Newsweek columnist who has been writing on personal finance topics for more than 30 years, focuses this rewrite on many of the top issues of today, such as recovering when you've been savaged by the economy. Last week she talked with me about how Americans can deal with today's tough market." "A financial management bible, updated . . . Jane Bryant Quinn has been teaching all of us how to better manage our money—for the better part of three decades." "A practical tour de force from the maven of money. This is simply the best handbook for managing personal finances that I have ever seen. It belongs on every bookshelf — or best yet, on every desk near every checkbook or computer." "The class book for practical financial advice—encyclopedic in scope and written with clarity and style." "No one is smarter about money—or easier to read or clearer or more conscientious—than Jane Bryant Quinn.